(Nanowerk News) A new method for "recycling" hydrogen-containing fuel materials could open the door to economically viable hydrogen-based vehicles. 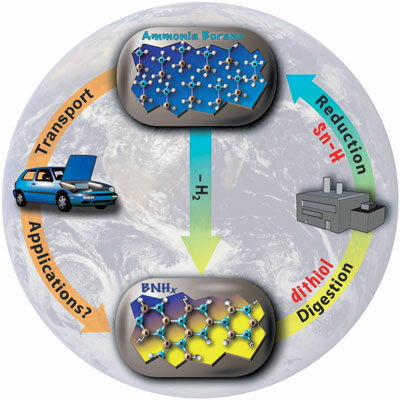 In an article appearing today in Angewandte Chemie ("Efficient Regeneration of Partially Spent Ammonia Borane Fuel"), Los Alamos National Laboratory and University of Alabama researchers working within the U.S. Department of Energy's Chemical Hydrogen Storage Center of Excellence describe a significant advance in hydrogen storage science. Ammonia borane (AB) is a potential hydrogen releasing fuel. In this Los Alamos National Laboratory graphic, the AB would be used on-board the vehicle to run a fuel cell. Once hydrogen is released, the AB could then be regenerated and reused. In the scheme shown, the recycle of dehydrogenated fuel back into AB would take place off-board the vehicle. Hydrogen is in many ways an ideal fuel for transportation. It is abundant and can be used to run a fuel cell, which is much more efficient than internal combustion engines. Its use in a fuel cell also eliminates the formation of gaseous byproducts that are detrimental to the environment. For use in transportation, a fuel ideally should be lightweight to maintain overall fuel efficiency and pack a high energy content into a small volume. Unfortunately, under normal conditions, pure hydrogen has a low energy density per unit volume, presenting technical challenges for its use in vehicles capable of travelling 300 miles or more on a single fuel tank—a benchmark target set by DOE. Consequently, until now, the universe's lightest element has been considered by some as a lightweight in terms of being a viable transportation fuel. In order to overcome some of the energy density issues associated with pure hydrogen, work within the Chemical Hydrogen Storage Center of Excellence has focused on using a class of materials known as chemical hydrides. Hydrogen can be released from these materials and potentially used to run a fuel cell. These compounds can be thought of as "chemical fuel tanks" because of their hydrogen storage capacity. Ammonia borane is an attractive example of a chemical hydride because its hydrogen storage capacity approaches a whopping 20 percent by weight. The chief drawback of ammonia borane, however, has been the lack of energy-efficient methods to reintroduce hydrogen back into the spent fuel once it has been released. In other words, until recently, after hydrogen release, ammonia borane couldn't be adequately recycled. Los Alamos researchers have been working with University of Alabama colleagues on developing methods for the efficient recycling of ammonia borane. The research team made a breakthrough when it discovered that a specific form of dehydrogenated fuel, called polyborazylene, could be recycled with relative ease using modest energy input. This development is a significant step toward using ammonia borane as a possible energy carrier for transportation purposes. "This research represents a breakthrough in the field of hydrogen storage and has significant practical applications," said Dr. Gene Peterson, leader of the Chemistry Division at Los Alamos. "The chemistry is new and innovative, and the research team is to be commended on this excellent achievement." The Chemical Hydrogen Storage Center of Excellence is one of three Center efforts funded by DOE. The other two focus on hydrogen sorption technologies and storage in metal hydrides. The Center of Excellence is a collaboration between Los Alamos, Pacific Northwest National Laboratory, and academic and industrial partners. Referring to the work described in the Angewandte Chemie article, Los Alamos researcher John Gordon, corresponding author for the paper, stated, "Collaboration encouraged by our Center model was responsible for this breakthrough. At the outset there were myriad potential reagents with which to attempt this chemistry." "The predictive calculations carried out by University of Alabama professor Dave Dixon's group were crucial in guiding the experimental work of Los Alamos postdoctoral researcher Ben Davis," Gordon added. "The excellent synergy between these two groups clearly enabled this advance." The research team currently is working with colleagues at The Dow Chemical Company, another Center partner, to improve overall chemical efficiencies and move toward large-scale implementation of hydrogen-based fuels within the transportation sector.